Intruder alarm systems are a worthwhile investment in the protection of your business, home and family. Studies reveal that it is far less likely that you will become the victim of a burglary if you have a correctly fitted and well maintained alarm system. Laser Security is committed to providing our customers with quality bespoke designed alarm systems that not only deter the unwanted but provide peace of mind in the knowledge that your property will be protected in your absence. We design each system specifically around you so as to be effective and yet user friendly, thus ensuring that the day to day operation of your premises and occupants are not restricted or hindered in any way. 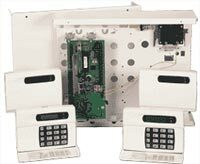 The heart of any intruder alarm system is the control panel. Our control panels incorporate a multi circuit micro processor based control system with individual multiple user codes and historical data files which can be viewed via a remote keypad or downloaded to a printer. We use a variety of detectors to activate the alarm system on intrusion such as Passive Infra Red detectors which can detect a person moving within a protected area, contacts that detect if a door or window has been opened, break-glass and vibration detectors often used as perimeter first line of defence and for area's with a high probabilty of false alarms we employ combined technology detectors which use microwave and infra red to confirm detection and which provide high immunity to false alarms. All Laser Security Systems are of unequalled quality from components through to installation and installed to the highest standard and where possible we will ensure that cable concealment is a priority. We operate a guaranteed four hour emergency callout service with full product support that will give you peace of mind knowing that help is not far away should a problem arise. Your new security system will be covered by our one year no-nonsense guarantee and upon expiry of the guarantee we will offer you a comprehensive maintenance contract which ensures your system will continue to operate as it should.